The Tigers get a walk-off win against the Mariners, who lost their second baseman indefinitely after he was hit on the hand by a pitch during the 5-4 defeat. DETROIT — Somehow a walk-off loss to a bad team without its best hitter on a day when their best pitcher was on the mound wasn’t even close to the worst thing that happened to the Mariners on Sunday at Comerica Park. The 5-4 loss to the Tigers on Jose Iglesias’ single through the drawn-in infield in the bottom of the ninth capped a disappointing series against a rebuilding Detroit team that was playing without Miguel Cabrera and playing with guys that the average fan has never heard of before. The Mariners were primed to win yet another series with lefty James Paxton getting the start, instead they failed to capitalize with runners in scoring position on multiple occasions (2 for 13) while stranding a small village of runners (11) on the bases. The Mariners suffered a far greater loss in the third inning. All-Star second baseman Robinson Cano was struck on the hand by an 88-mph fastball from Tigers starter Blaine Hardy in his second at-bat. The ball rode up and in on Cano, who couldn’t get out of the way. It made a sickening sound as it struck the back of Cano’s hand flush against the bat, fracturing the fifth metacarpal below his pinky finger. Cano was in obvious and immediate agony. After a brief conversation with Servais and senior athletic trainer Rob Nodine, he was removed from the game. Cano hates coming out of games, but there was no playing through this pain. 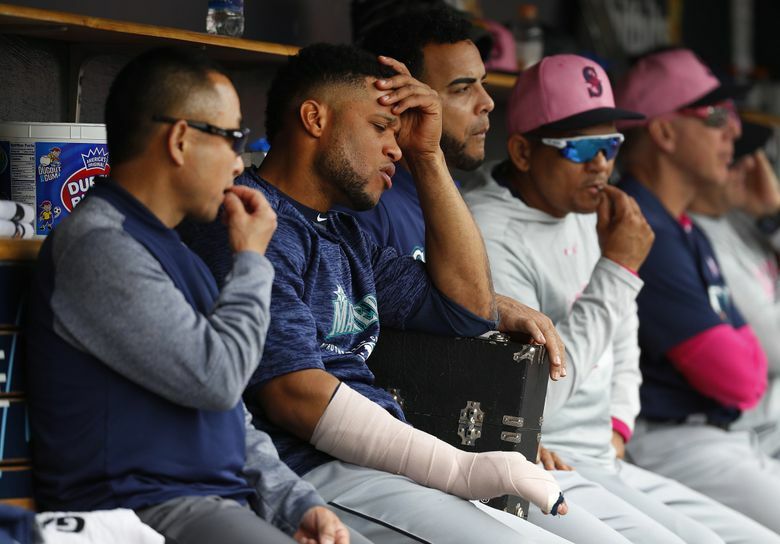 Cano will travel with the team to Minneapolis on Sunday night and then fly to Philadelphia where he’ll see a hand specialist on Tuesday to determine the extent of the fracture and the treatment for it. But where do the Mariners go from there? Cano will be out at least a month if not longer. Coach-speak aside, the Mariners will have to place Cano on the 10-day disabled list and bring someone up to fill his roster spot. The possible include Taylor Motter and Gordon Beckham. While Motter has hit some homers in the past few games for Class AAA Tacoma, he’s hitting .198 on the season. Beckham came into Sunday hitting .300 with a .912 on-base plus slugging percentage. A veteran that’s played over 900 big league games, the Mariners trust Beckham in that role. He also has an opt-out clause for his minor league contract on Tuesday, which he may exercise if not added to the 25-man roster. What about moving center fielder Dee Gordon, who was converted to the outfield from second base this season, back to his old spot where he earned Gold Glove honors with the Marlins? Gordon has not worked out at second base this season. Paxton gave the Mariners a decent start. Obviously he wasn’t going to be able to replicate the dominance of his previous two outings — 16 strikeouts over seven innings vs. the A’s and a no-hitter vs. the Blue Jays. He pitched six innings, allowing three runs on six hits with no walks and four strikeouts. His streak of scoreless innings was halted at 18 when the Tigers scored two runs in the third inning on three singles and a fielder’s choice. He admitted there was some residual fatigue from the previous two outings and also some poor pitch decisions. Down 4-2, the Mariners rallied in the eighth inning, loading the bases against reliever Joe Jimenez. With two outs, Jean Segura hammered a hard groundball just off the glove of a diving Iglesias at shortstop to score two runs and tie the game. The Mariners lost it in the ninth on three soft groundballs. Juan Nicasio gave up an infield single Jacoby Jones. Niko Goodrum snuck a groundball past a diving Ryon Healy at first base, setting up Iglesias for the walk-off groundball to center.